For high school seniors, the countdown has begun to prepare and submit their college applications. As students are exploring their options for a brighter future, the competition among higher education institutions is becoming fiercer. According to the U.S. Department of Education, more than 4,700 degree-granting two- and four-year schools nationwide are battling to recruit students. And that’s not including e-learning organizations, which make up an industry worth $166.5 billion. While colleges and universities are designed to enroll students between two and four years, online educational platforms can reach a broader audience, spanning different generations and professions. More businesses are also considering credentials other than a degree, such as a certificate in a specialized area, when recruiting candidates—making education an even more competitive space when it comes to attracting and retaining students. The organizations that can successfully engage their students from enrollment to alumni will stand out among their peers. To examine student engagement practices, we compared non-profit and for-profit universities (MIT, University of Phoenix) and e-learning organizations (Codecademy, Course Hero and Udacity): we created an account with each school, completed a user profile, interacted with them online for three weeks and analyzed the messages that were delivered. As a result, we received more engaging responses from the e-learning space, and would like to share the messages that caught our eye. 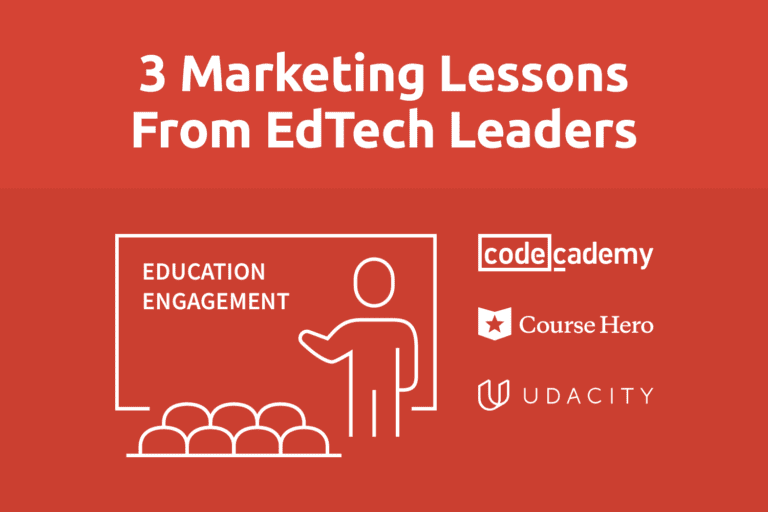 Here are three marketing strategies that universities can adopt from their e-learning peers to compete for student attention. While colleges and universities are busy sending candidates postcards, course catalogs and other mailing information about their programs, it’s also crucial that they prioritize digital forms of communication. The first step of a student’s application journey might be creating an account via your school’s admission page; in that case, sending a welcome email tailored to their interests (majors, schools, athletic programs, etc.) always leaves a pleasant first impression. However, based on our research, we only received a single transactional email from MIT after signing up on their admissions system and nothing at all from the University of Phoenix. 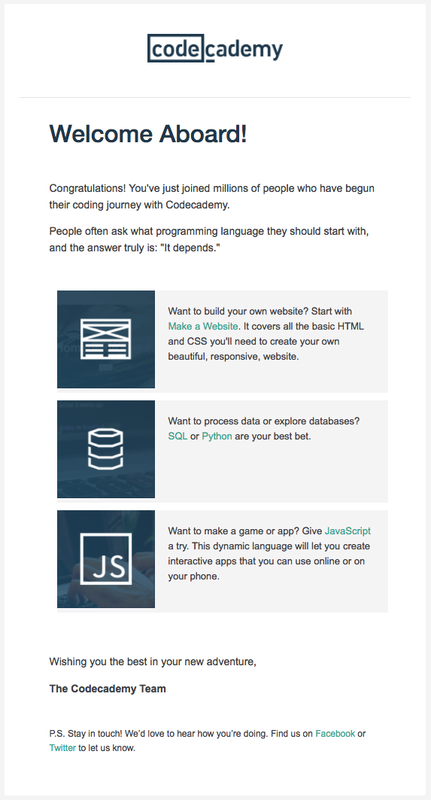 Yet Codecademy, an online platform that offers free coding classes, stood out because of their welcome message. While creating a user profile on Codecademy, we showed our interests in web development. A couple of minutes later, we received a welcome email with related course highlights. Given the fact that we, as consumers, are bombarded with more than 10,000 brand messages each day, it’s safe to say that only those that offer relevant messaging will resonate with audiences, while the rest will get lost in the noise. An engaging welcome email sets the stage to kicking off the student lifecycle. The adoption of mobile devices has never been this ubiquitous: 98% of Millennials aged 18 to 24 own a smartphone. Students are using their phones to follow colleges on social media, share class notes and get updates on campus events. That said, many universities have yet to fully invest in engaging candidates and enrolled students on mobile. For instance, both MIT and the University of Phoenix exclude access to their mobile apps to only enrolled students, even though we were able to create an account as a candidate via the school’s admission page. In comparison, without a hard line drawn between prospective and enrolled students, e-learning platforms can more actively market on mobile. Udacity, an online educational organization focused on technology and business courses, exceeded our cross-channel expectations. 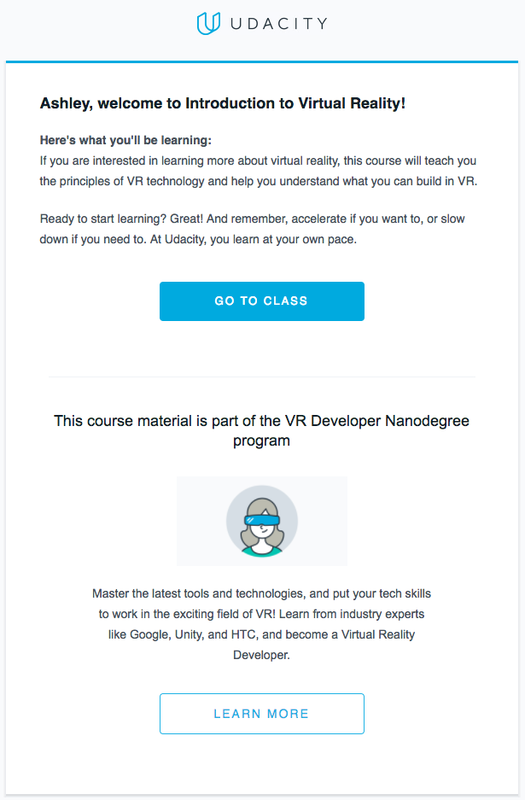 After watching part of a virtual reality course on Udacity’s mobile app, minutes later, we received this welcome email that introduced more course information. In today’s digital world, students’ interaction with schools is no longer limited to a single device. If education marketers want to fully understand their students and meet their specific needs, they must map out the student experience on mobile as well. It’s important to note, however, that achieving true omni-channel relevance is more than simply having a mobile app. Marketers must coordinate their messages across channels to deliver a personalized experience. Although we did receive a phone call from the University of Phoenix during our three-week study, having a 1:1 conversation with an organization should also involve online forms of communication. 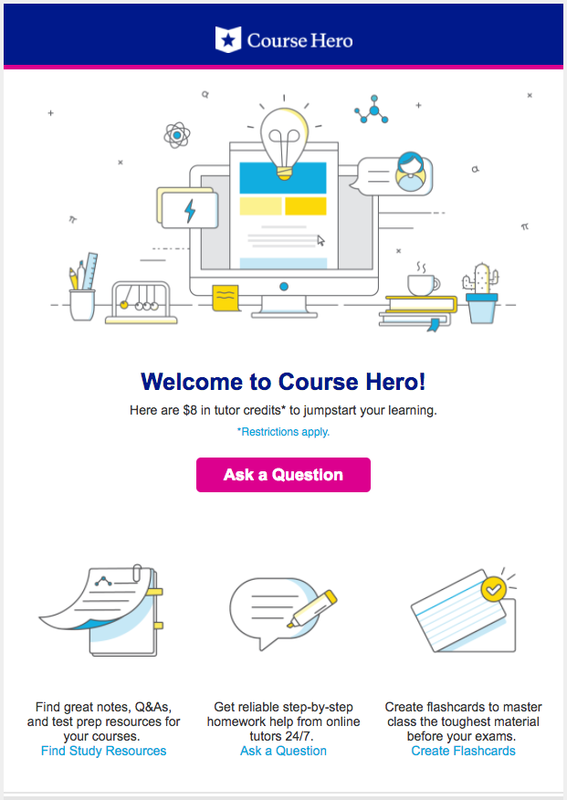 For example, study resource hub Course Hero provided a great example of how to successfully coordinate messages across marketing channels. After we signed up for the service, we received a welcome email including $8 in tutor credits. We then downloaded their mobile app and received an immediate push notification enticing us to use our credits. This message sequence showcases a seamless user experience across channels. 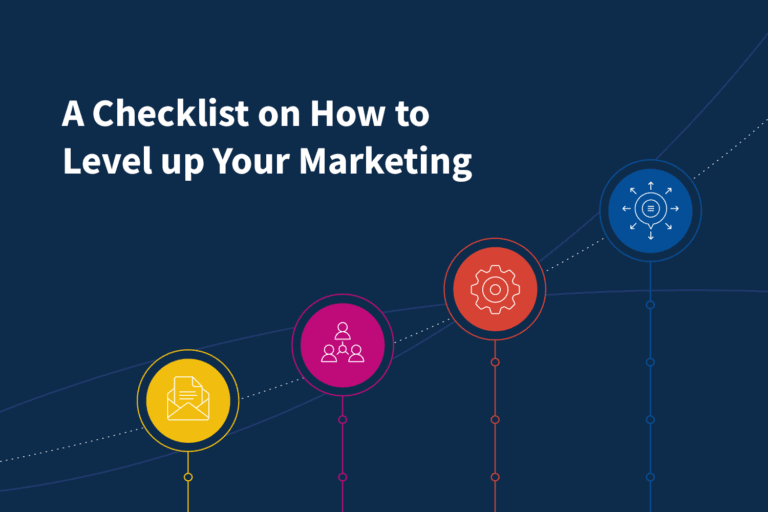 Marketers at traditional universities should consider all student touchpoints—informational sessions, campus visits and events, class enrollment deadlines—and design similar workflows to engage their candidates at the right moments. 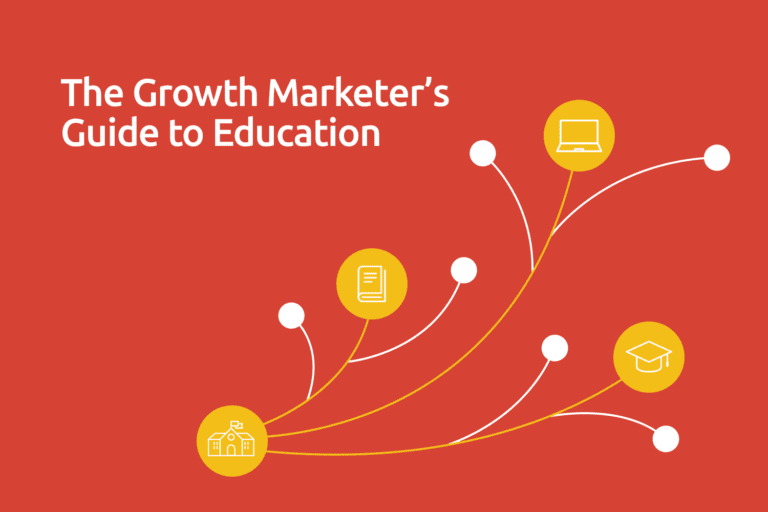 Want to learn more about best marketing practices from educational institutions? 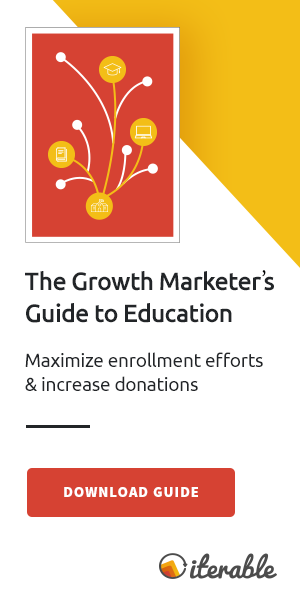 Download our newly released Growth Marketer’s Guide to Education to learn how to maximize enrollment and alumni donations.